[Thank you for participating - the giveaway is now over!] 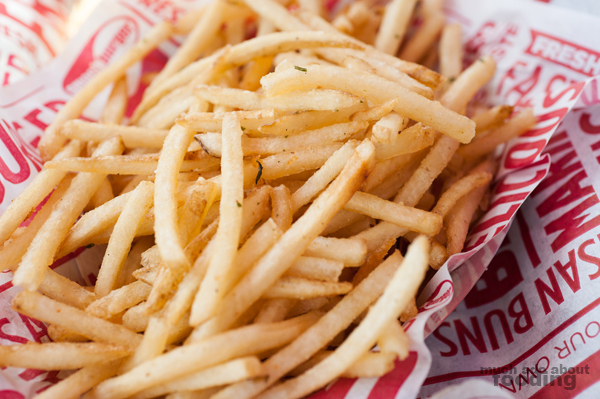 Begun in Denver in 2007, Smashburger became a fast-growing chain that took everyone by surprise with its rapid expansion. There are currently hundreds of locations worldwide of this fast casual restaurant chain that was started by people who had formerly worked as executives in fast food; the vision for the newer concept was to be viable against the corporate giants of the fast burger world but through conscious decisions. Ingredients are different by far but quick service and turnaround for orders is still a priority. 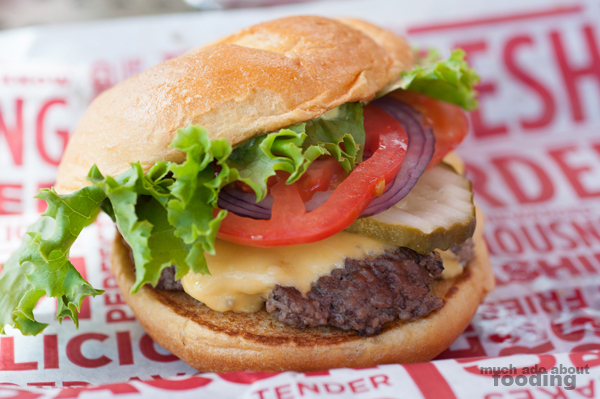 When Smashburger opened its doors in Irvine just a few weeks ago, fans who previously had to drive further south in Orange County to get their hands on a Smashburger were excited. The food is prepared fresh daily, making it more attractive than the frozen-then-reheated fast food joints around, and since we had never been to one, we went to check it out upon invitation one weekend afternoon. We met with General Manager Daniel (DJ) Fackrell to get a sense of what the Irvine location had going on that might hook us in. 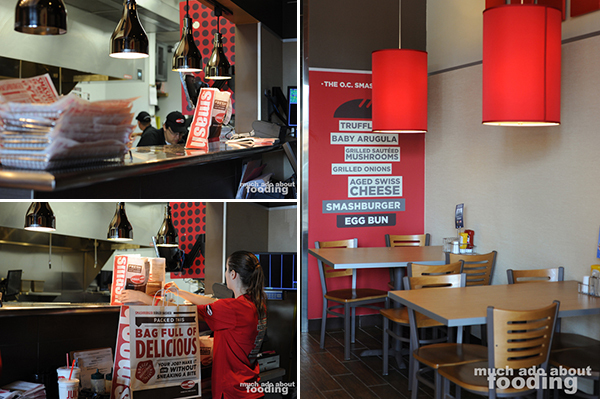 The Smashburger chain is built up through franchises, allowing enthusiastic business owners to operate one of these simple concepts without foregoing quality as they have several district managers to regulate. 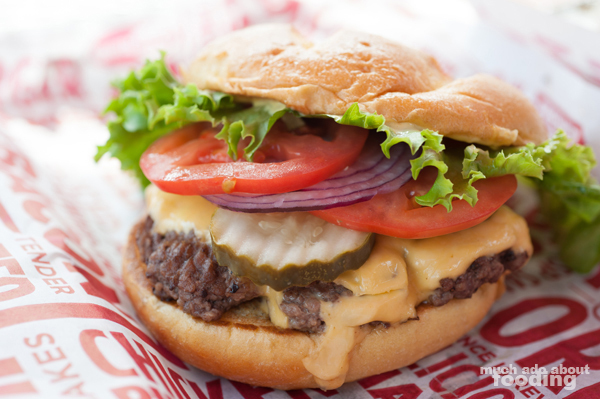 That way, owner Tom Ryan is able to maintain consistency of the Smashburger brand and keep the focus on the food. When we spoke to District Manager Greg McCollum who had come from the Denver headquarters to helm the Orange County area, he beamed, "The biggest thing I enjoy about Smashburger is that the quality of food never changed with expansion. There were a lot of ways we could have cut corners for a cheaper product that would have been reasonable to do but we didn't." When we entered the location, the staff seemed to be synced with each other as they greeted us cheerily. We witnessed this phenomenon several times throughout the visit as every door opening led to a blast of "Welcome to Smashburger!" from behind the counters. 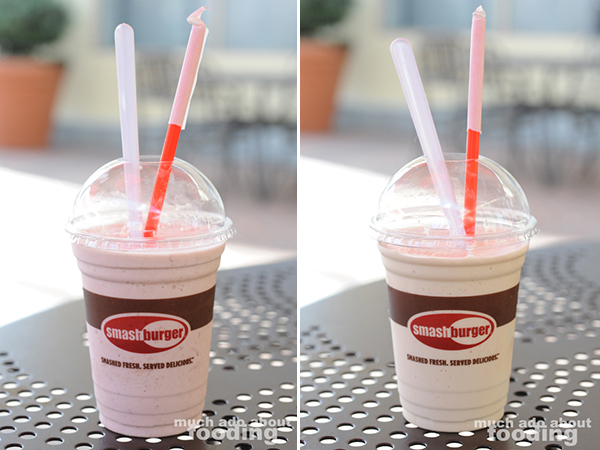 With proprietary recipes for their buns, dressings, and seasonings, Smashburger takes obvious pride in its work. Fackrell was enthusiastic himself about the special thick pickles the burgers have which are able to stay crisp despite the heat of the patties. They hand-bread their onions to order and fry items in a combination of canola oil and beef tallow; in other words, this is not the place to go if you are seeking health-conscious meals. Whole milk and heavy cream Haagen Daaz premium ice cream constitute of their popular shakes as well. Again, not for the calorie-counter. What we found interesting as the burgers were brought out was that they were served open-faced in wire baskets with actual utensils. The presentation is apparently to show customers exactly what they are getting without any mystery behind it AND so that they don't have to disassemble everything to "correct" their burger as they see fit (maybe you didn't want the pickle?). As for the name, it comes from their method of cooking the burgers. Each patty starts as a ground beef "meatball" which is rolled onto the flattop and smashed by a flattop "arm" from above, cooking the meat evenly on both sides. Then the slices of cheese are placed on top whereupon the arm will come down again just shy of touching the cheese to sweat the slice over the meat. Pretty neat! This method allows their ticket time per burger to be just a mere 2 1/2 minutes long (as long as the fries take to make) instead of the industry average of 4 1/2 to 6 minutes long. There are several different options for customers coming in when it comes to burgers and sides. With items being served a la carte, you have plenty of choices; we opted for three to try out. 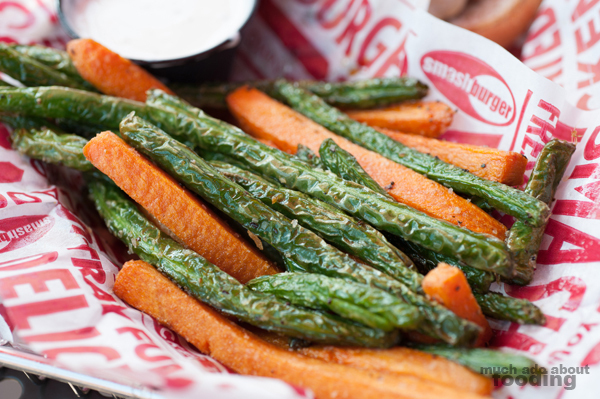 Their 3/16" fries can be turned into SmashFries ($2.29 - tossed in Italian olive oil, rosemary, and garlic) for a much different dimension of flavor from the extra herb treatment. We also went for their Veggie Frites ($2.99) and their very popular Haystack Onions ($2.49) just to get a comprehensive look. It became fairly obvious why the SmashFries would be preferred because the rosemary and garlic made it more savory and appealing. We found the veggie frites to be much too salty for our taste and abandoned it quickly but the most liked was definitely the onions. 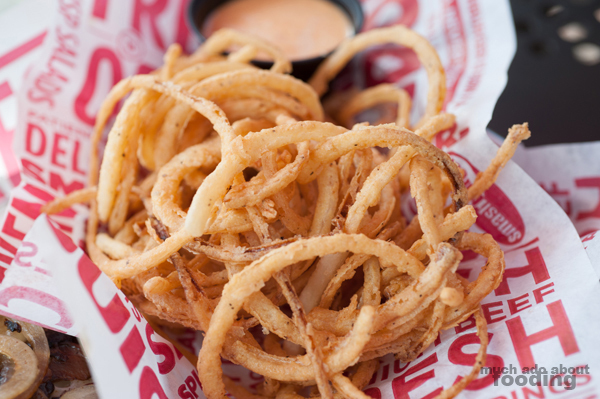 Sliced very thinly and coated in a seasoned batter, the onion rings were enjoyable both as a side and also to stack with each burger bite! Once we got to picking the burgers, we realized that there were several options including a limited time sandwich which they switch out every three months, the current one being their Spicy Buffalo. 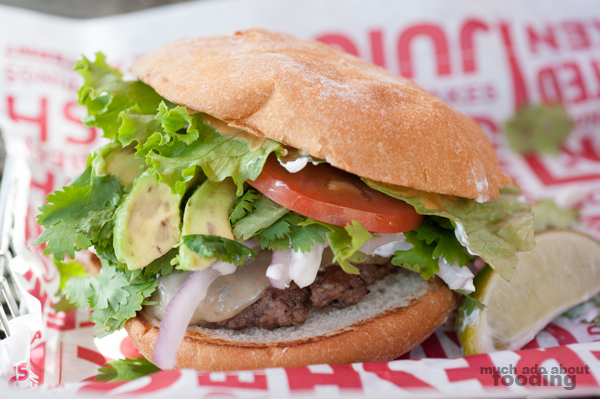 There is also always a regional burger which plays to the flavors of the communities Smashburger opens in. Examples include their Bluegrass Burger in Kentucky, Michigan Burger which contains a lot of olives, Colorado Burger on a chipotle bun with Anaheim chiles and both Cheddar and Pepperjack cheese, Kuwaiti Burger for their location in Kuwait which contains veal bacon, and so on. With restaurants in several countries including Costa Rica and Saudi Arabia, it makes sense for the brand overall to be able to develop community-driven versions. To see what would constitute Orange County's region, we snagged the regional burgers with our order. The burgers come in two sizes with a Regular containing a patty just under 5 oz and the Big with one under 7 oz. You can also sub patties for their vegetarian black bean burger, grilled chicken, or crispy chicken. We chose the Classic Smash ($5.39/$6.39 - American cheese, Smash sauce, ketchup, lettuce, tomatoes, pickle, and onions on an egg bun), Local Recipe: SoCal ($6.39/$7.39 or $6.99 grilled or crispy chicken - fresh avocado, cilantro, Pepperjack, lettuce, tomato, onion, sour cream, and chipotle mayo on a telera roll served with a wedge of lime), and the O.C. 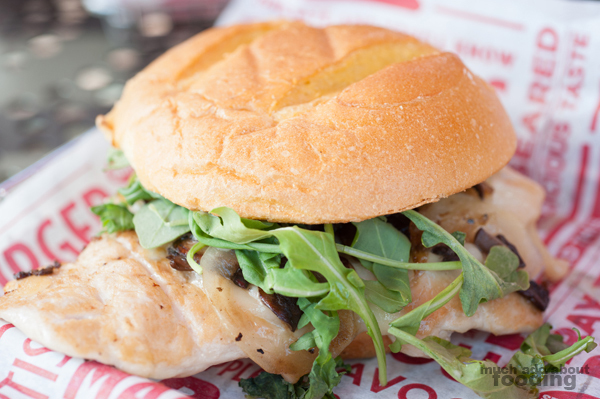 (aged Swiss cheese, truffle mayo, baby arugula, grilled sauteed mushrooms, and grilled onions on an egg bun) with grilled chicken. The Classic Smash is simply named so and with good reason, I believe. It is a classic cheeseburger through and through with some unique variation due to their namesake sauce. The patty had the familiarity of a fast food beef patty but with a much better ingredient that gave heartiness to each bite. The vegetables were crisp, and Fackrell was right about the pickles - what a crunch! The SoCal burger was spot-on when it came to why it was called such. Not only was the avocado a dead giveaway for our region but the use of sour cream and cilantro reminded me of a taco. The telera roll also was different, really showcasing the southern Californian-Mexican influences in the area's cuisine. Then there was the O.C. burger which just struck me as over the top (or was that the point?). Overall, the ingredients played well together but after so many bites of everything else, this just seemed too much. Swiss already has such a heavy flavor to it that when paired with truffle mayo and the umami in so many grilled mushrooms, the sandwich felt overbearing. If you're going to do this one, you'll have to be in the right mood! Not only do they serve up burgers though but they also have four different entree salads including one that used to just be a rotating special - their Spinach Cucumber Goat Cheese. These salads come without meat but can be augmented with grilled or crispy chicken for $2 more. 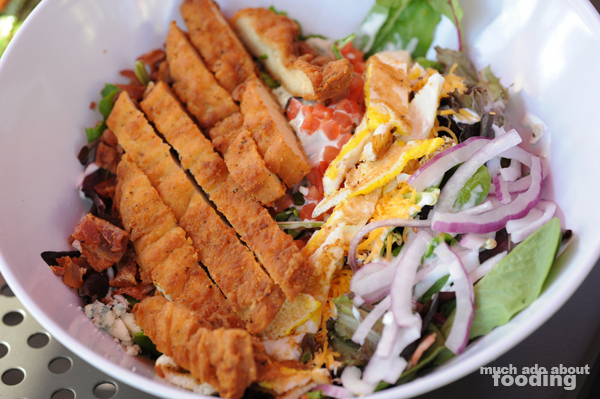 We chose the Classic Cobb ($5.99 - fresh greens, Bleu cheese, fried egg, Applewood smoked bacon, tomatoes, onions, and Cheddar cheese topped with buttermilk ranch dressing) with some crispy chicken on top. I really liked the batter on the chicken for its seasoning and appreciated just how crunchy the stripes were; its inclusion was actually what made the salad enjoyable though. Otherwise, the dressing was slightly scant. I also found the fried egg a strange approach to a Cobb rather than the typical hard-boiled dices; it was more distracting than not. However, the size of the salad is definitely for an entree and will not disappoint there. I liked how fresh the greens all were as well. To finish it off, we had to give attention to the shakes they like to showcase. At $4.59 each for premium flavors (not the typical chocolate, vanilla, or strawberry), these shakes are not compromises for desserts. We ended the meal by getting their Peanut Butter and Jelly and popular Salted Caramel. With their shakes, the flavors are not from syrups but from cookies and fruits themselves. In the peanut butter and jelly, there were crushed up Nutter Butter cookies and strawberry pulp which made for a tasty experience. The shakes were quite thick but still drinkable through a straw and a good way for customers to get some sweetness in. 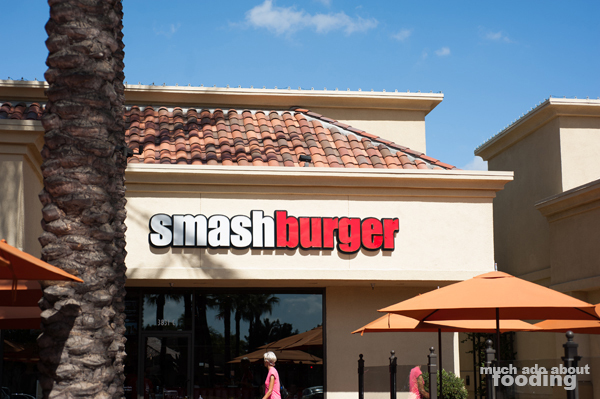 Congratulations to Smashburger for getting into Irvine and expanding even more. We tried to pry into the upcoming locations opening in Orange County but only got information that they are working on two more locations at the moment. Too bad we didn't get more of a scoop but my guess is that they are going to keep moving north. We'll have to see about that! For now, let's focus on how to best enjoy this new Irvine fast casual joint. They have graciously contributed vouchers for Much Ado About Fooding readers to try out their burgers - check the details below! The giveaway will run until 10/10/14 at 11:59pm PST. Winners will be contacted upon winning and have 48 hours to respond before runner-up winners are drawn.